Published: Oct. 21, 2018 at 03:19 p.m. Published: Oct. 21, 2018 at 02:02 p.m.
Buffalo Bills running back Chris Ivory rushes for a 21-yard gain against the Indianapolis Colts for Week 7 of the 2018 season. 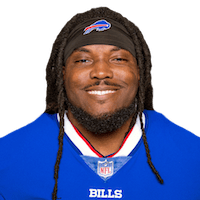 Published: Sept. 16, 2018 at 03:05 p.m.
Buffalo Bills wide receiver Chris Ivory receives the hand off and rushes up the middle for a touchdown. Published: Aug. 26, 2018 at 05:18 p.m.
Buffalo Bills running back Chris Ivory refuses to be taken down as he shakes off multiple defenders on a 20-yard run.